Unlike Awo-omamma, there exists only one tradition- Isu-egbulem tradition accounting for the origin or genealogy of Amiri town. This tradition agreed that the people of Amiri possess a common parental descent with the people of Awo mamma, as postulated by the Oma tradition- one of the traditions accounting for the origin of Awo-omamma. Where there exists a difference between the two postulating traditions was on the parental nomenclature of both towns as well as their sibblings. According to Isu-egbulem tradition, the origin of Amiri town is traceable to a man called Isu-egbulem who got married to two wives- Asiabaka (the first 40 wife), and Mbubuka (the second wife). Mbubuka was married after the demise of Asiabaka who begot only one son known as Oru for Isu-egbulem. She (Mbubuka) begot five sons- Amucha (the first son), Nkume (the second son), Atta (the third son), Amiri (the fourth son), and Awo-omamma (the fifth and the last son)- also for Isu-egbulem. Thus, this tradition established the fact that Isuegbulem, and Mbubuka (instead of Oma, and Mma) were the ancestral parents of the people of Amiri and Awo-omamma. Similar to Amiri and Awo-omamma, the other three children of Mbubuka in search of settlement emigrated and established towns after their names in the old oru division- Amucha in Nwangele Local Government Area, Nkume in Njaba Local Government Area, and Atta also in Njaba Local Government Area. These names reflect the origin of the people of these towns 21. Subsequently, Amiri got married. He maintained a polygamous family by marrying two wives (whose names were not mentioned). The first wife who hailed from Isu begot four sons namely Umuecheta, Amuka, Isiorie, and Umudioka, while the second wife who hailed from Oru begot five sons to include Umuduru, Mbubu, Amaokpara, Ubahazu, and Ugbeke. The names of these children of Amiri are presently borne by the nine (out of ten) villages in the town to reflect their lineages. With time, Amiri begot twenty-eight grand children from his nine sons whose names are borne by the kindred in this town. More so, the names- Isu, and Oru are equally borne by the two (out of the three) autonomous communities of the town as suffixes in their existing names- Amiri Isu, and Amiri Oru- to refletct the origin of the villages in these autonomous communities. 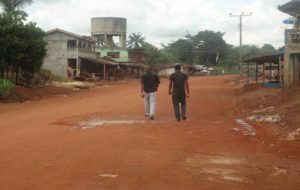 Umuduru, which was a village in Amiri Oru became an autonomous community- Umuduruigwemmadu autonomous community having sought for autonomy. This brought the total numbers of the town’s autonomous communities to three. In the preceding information (by Chief Adol Onyima), it was mentioned that Amiri community constitute of ten villages. The recognition of Nchoko, who was not among the first generation sons of Amiri, as a village (alongside the first generation sons) brought the total number of the villages in the town to ten. This development earned the three children of this son of Amiri recognitions as kindred in Nchoko village thereby bringing the total number of kindred in the town to thirty-one (see appendix II- villages and kindred in Amiri community). According to history, Nchoko was a grand son to Amiri and one of the children of Mbubu who was known for his laziness in farming activities, but has passion for warfare. He was belligerent. His other siblings included Umuduruogwu, Amakpu, and Ugboloha- names which are today borne by the three kindred in Mbubu village. As a result of his laziness, Nchoko was dependent on his brother, Umuduruogwu, for food, shelter, and medication. Consequently, he became part of his brother’s family. Upon his decision to become independent, Nchoko sought for dwelling place in his father’s land. Due to lack of space, he decided to emigrate from Umuduruogwu in search of his own settlement. In respect of his decision, he was thus advised by his brother to seek for assistance from their uncle, Ubahazu, who was known for his benevolence. Ubahazu however allocated to his nephew (Nchoko) a small piece of land beside a small body of water known as Mmiri Umu Ewi which is located at the bundary of Ubahazu village, and a part of Otulu town where Ama John Nwaochia (presently Amiri junction located beside Awo-Omamma junction along Owerri-Onitsha trunk A road) is situated. The multiplication of the descendants of Nchoko in number brought about their expansion into this part of Otulu which shares border with Ubahazu. Subsequently, due to their belligerent nature and bravery, they were able to claim over this area from the original owners. These aforementioned features were equally responsible for their subsequent assumption of the status of a village having agitated for such recognition. ONE LOVE KEEP US TOGETHER! HRH Eze B.N Igbodekwe 111 of Amiri-Isu. Legend Amiri evolved from the Umunnenasaa nation, namely (in order of seniority) 1. Isunjaba, 2. Eziamaobaire, 3. Amusa, 4. Nkume, 5. Atta, 6. Amiri, 7. Awo-Omamma. These ancient villages (now clans) worship one common dirty Eke Njaba, and had their geographical location/settlement along the course of the Njaba river. Colonial administration in 1900 brought Amiri and Awo-Omamma into western Oru and the rest of their kinsmen into Isu. Amiri clan of today consist of four autonomous communities with four Traditional Rulers. 1.HRH Eze B.N Igbodekwe111, Obi-Gedegwum of Amiri-Isu and Head of Amiri Clan. 2. HRH Eze D.D Nnabuo, Igwe 111 of Amiri ORU, 3. HRH Eze L.O Obilom, Duruoha 11 of Umuduruigwemadu Amiri, 4. HRH Eze C. U Uzoukwu, Mbu 1 of Mbubu Amiri . Wow! I am overwhelmed by this history, proud to come from Amiri. Am married to amiri and don’t know anything about the amiri. These 9 sons and Nchoko make up the 10 villages in Amiri. Nchoko, though not one of the first generation sons of Amiri, was made up of prominent warlords at the time. They left Mbubu and headed south in search of better life. They found good land between Ubahazu, Umuduru and Otulu where they settled and formed the last of the ten villages in Amiri. It should also be noted that Amiri was the seat of the defunct Biafran Navy where the naval commander, Capt. Anukwu held sway throughout the Nigeria/Biafra war.